I had the privilege and pleasure to spend the past 2 days in Atlanta at the Graco headquarters for the Smart Seat Launch conference for car seat advocates. I feel honored to be amongst the 13 car seat advocates invited – with “just” 13 years experience in the field I was the baby of the bunch and was humbled to be in the company of greatness – as the other 12 advocates have devoted many years of their lives helping to keep children across this country safe when riding in cars. In an effort to be as transparent as possible, Graco invited us to preview their new seat – but it was more than just a preview. This was an opportunity for those of us with the highest level of expertise in the field to share our thoughts and feedback on this and other products with the engineers and product design teams so that we can work together to create the best seats possible – ones that not only offer the best crash protection, but also facilitate proper use and fit the widest range of children possible. Why is this seat a game changer? You know the old adage, “only infant seats have bases”… well, rules were meant to be broken and the Smart Seat has rewritten the rules. This seat comes in 2 pieces – there is a “stay in car base” and the shell that the child rides in. The base is not optional – i.e. 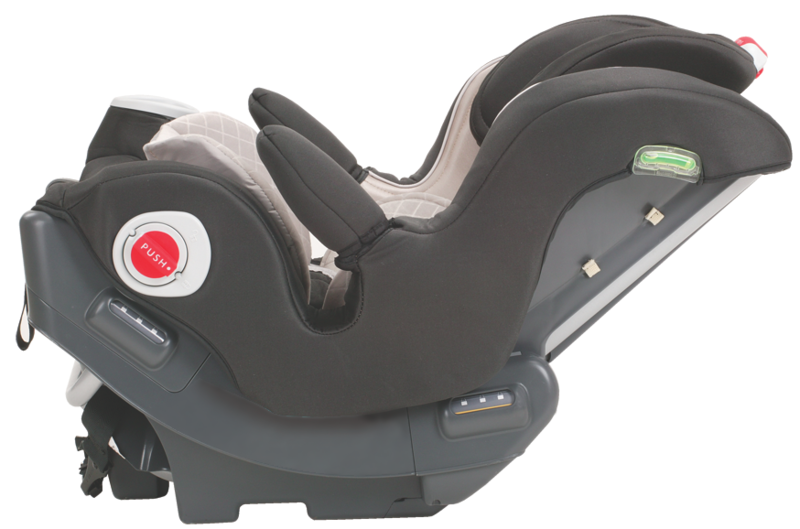 unlike most infant seats that can be installed with or without the base, you MUST use the base on this seat. The base is used when the seat is installed rear-facing & forward-facing – but is NOT used in the booster mode. You know that fantastic built in lock-off that appears on the Snug Ride 35 base? You guessed it – the Smart Seat has it too – which makes a tight installation as easy as pie. Narrowest belt path of any seat – which works GREAT for the narrow center in many vehicles (some centers are as narrow as 8 or 9 inches “wide”) – and while the base itself is much wider than 8 inches, it is possible to access the side seat belt buckles due to the fact that the base is cut out and raised on the sides. This is not the case with any other forward-facing car seat – none others have this narrow of a “footprint”. 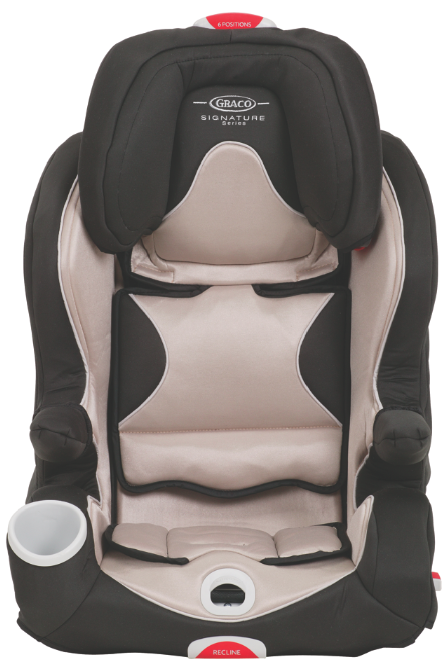 No towels/noodles needed under the seat to make it reclined enough for a young infant – all recline adjustments are made on the shell once the base is installed. This is the first, and currently only, Graco seat to allow the use of the lower anchors at any spacing so long as the vehicle manufacturer designates that seating position as a LATCH position. For more info on center LATCH, visit this older post – please note that the table on this post will be updated to include this Graco seat once the seat becomes available on the market. You can store the 5 point harness in a handy hideaway when the seat is in booster mode – so you don’t have to worry about taking the harness out and/or losing it. This is not a seat for travel. Why – it weighs 35 pounds. If that isn’t enough, it is likely too wide to fit on most airplane seats – that is if you could haul it down the aisle anyway. Currently, when it is installed rear-facing it sits quite reclined, which for older toddlers who are eager to look out the back window might be problematic as they get more of a view of the roof than the back window. HOWEVER – GRACO HEARD THIS FEEDBACK AND WILL LOOK INTO WHETHER THERE IS A WAY TO ALLOW OLDER KIDS TO RIDE MORE UPRIGHT WHILE REAR-FACING. IRONICALLY, SITTING THIS CAR SEAT MORE UPRIGHT ACTUALLY INCREASES THE CHILD’S LEG ROOM, AND INCREASES THE LEG ROOM FOR THE FRONT SEAT OCCUPANTS. This is a wide seat – great if you have a captain’s chair in a minivan, but problematic if you are trying to fit 2 car seats in the back seat of a car or SUV while still allowing enough room for a person in the back. With the current recline position allowed for rear-facing it takes up a fair amount of room into the front seat – and will likely not fit rear-facing in the center of many vehicles unless the driver and front passenger don’t need a lot of leg room. 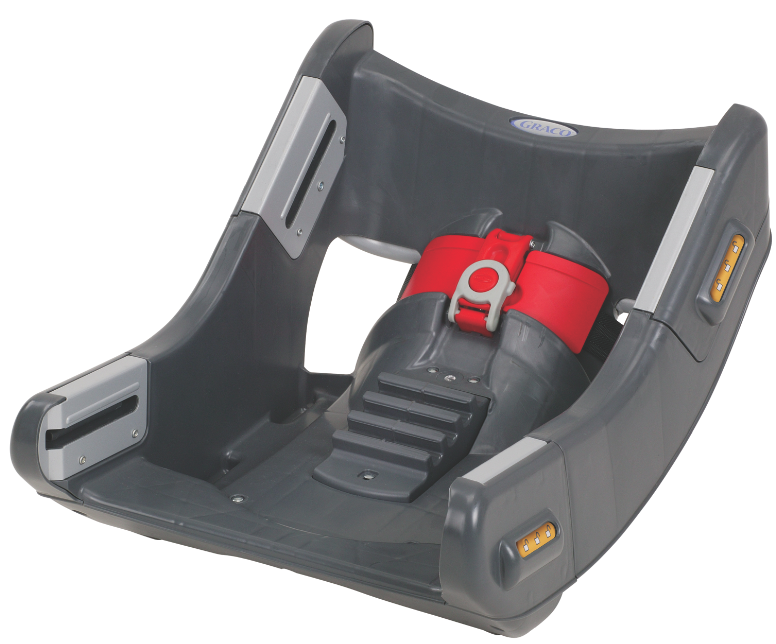 The crotch buckle distance is only 6.25in (the same as the Graco Nautilus) which by 3-4 years of age is coming from under the child’s bottom, rather than in front. 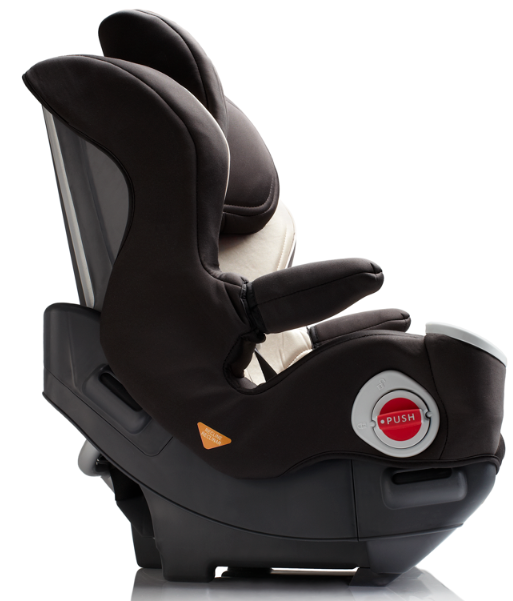 In the booster mode (as with the Graco Nautilus in the high back mode), the top head rest height is not nearly tall enough to accommodate a child who is approaching 4’9″. ← >Good Morning Las Vegas! >I would prefer the Evenflo Symphony 65 with sure latch … Easier to install and you can buy two for the price of a seat and base!!! >Disappointing that the top harness height isn't higher. My tall-torso kiddo would outgrow the harness well before he's ready for the booster. >Why do they say the strap covers have to be used, and then removed later? I'm confused, are they providing something other than chaffing protection? >You couldn't use center LATCH in a Honda with only outboard anchors, because Honda doesn't allow for borrowing. But, in say a Ford, some models allow for use of the outboard anchors to create a center LATCH position if the carseat also allows. This carseat would allow. Many other carseats also allow for non-standard spacing if the vehicle also allows, but they have certain spacing requirements (ie 11-18 inches). @Danielle – I assume you meant on a 65 pound carseat? 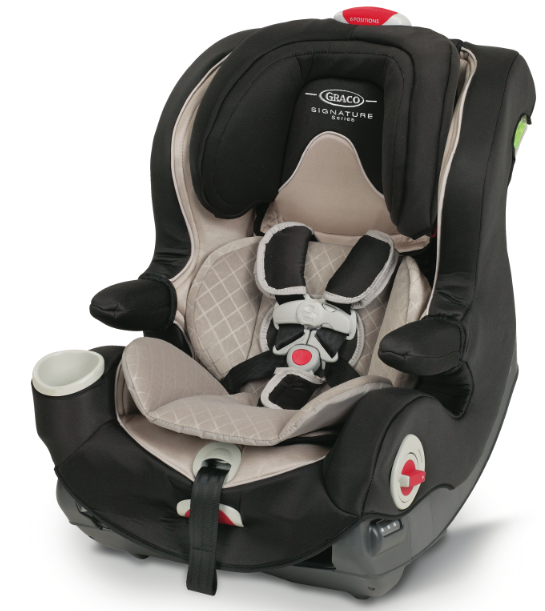 If Graco allows use of LATCH up to 65 pounds with this seat, that doesn't mean that the vehicle allows it. Many other carseats have 65 pound limits, but the weight limit for LATCH is lower. LATCH is a required component by law, so there isn't an option to not provide it. @Nava – There is no evidence that a harness is safer for a child who is large enough and mature enough to ride properly in a booster. Children under 40 pounds are at increased risk, as is anyone who is out or position. We just don't have any studies that say that harness is better than booster, or that booster is better than harness. In fact, there is a school of thought that says that a booster is safer because it allows the head to move with the upper torso, rather than the head moving forward while the torso is strictly restrained. >I'd wear a 5 pt too! When can we expect this seat to hit the market? My one year is going to need a new seat soon! >Acrophile- Harnessed is always safer. A 'step up' to the next seat is a step down in safety.. Heck, I'm 5'2" and I'd wear a 5pt. [racer-style] harness if I could! >By the time a child is approaching 4'9" aren't they about ready for a backless booster?? Some adults are shorter than that in the driver's seat. >With a 35lb carseat, why have LATCH? Hmmmm does Graco know something we don't know yet? >I of course forgot to measure the shell height – but looking at it I would say it is probably about the same (I would guess not shorter than the My Ride). It seemed generously proportioned. >Thanks for the quick, thorough review! Did you measure the shell height for rear facing by nay chance? Is it taller than the My Ride rear facing? >10 years for the expiration (but it is not yet clear whether there will be a shorter life span when using the harness). Price is $299, and $99 for an extra base. >How many years until expiration? Any idea on the price point?